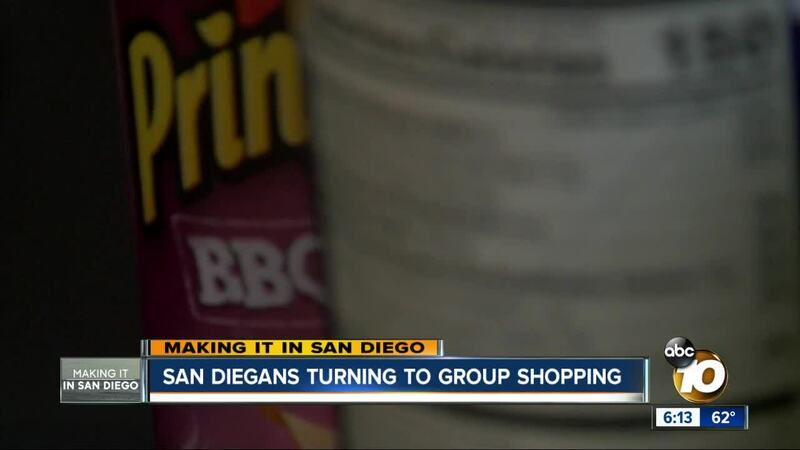 As the cost of living in the San Diego area continues to stretch budgets, some are turning to group shopping. SAN DIEGO (KGTV) - As the cost of living in the San Diego area continues to stretch budgets, some are turning to group shopping. Michelle Vann loves online shopping. "It provides the convenience I need as a busy mom," said Vann. These days, she is not shopping alone. 10News met up with her as she logged onto the shopping website and app Boxed, which offers up mostly bulk items. Vann clicked on the "Group Ordering" option. Many of the items on her list are for a Super Bowl party. From snacks to plates to beverages, she loaded up her cart, but it wasn't quite checkout time. "I can share this with in-laws and my mother all live in San Diego," said Vann. Van sends out the link to others to add to the cart. When complete, she will check out and within a few days, the order shows up at her door. "No membership fees and there's a substantial savings in terms of time and money. There's also a lot of flexibility," said Vann. Vann believes the group bulk shopping saves her hundreds of dollars every year. Chieh Huang, co-founder of Boxed, says the group ordering function has continued to take off since they put it in a year ago. He's seen family, friends, and neighbors buying in bulk and splitting the costs. "The concept of group ordering is striking a chord with customers because it's so easy to build a basket at the same time with other folks who want to buy the same thing. Because you're buying so much, it's generally cheaper than anything on the unit price than what you can buy online," said Huang.